Far-Infrared Heat is a safe form of light energy that directly heats the body without heating the surrounding air. When you're outside on a sunny day in the winter, and feel warm - the heat that you feel is infrared light from the sun. However, unlike light from the sun, infrared rays can penetrate skin and the underlying tissues up to 3 inches. It is known to relieve stress and tension, improve blood circulation and promote a deep and restful sleep. Therasage uses Natural Jade in its massage bed, which when heated emits far-infrared heat that is known to relieve back and muscular pain, increase flexibility, improve circulation, and enhance metabolism. Pain Relief: Far-infrared heat stimulates vasodilatation of peripheral blood vessels, bringing oxygen to joints and extremities, speeding the healing of sprains and strains, thus relieving pain and reducing the time it takes to recover from an injury. 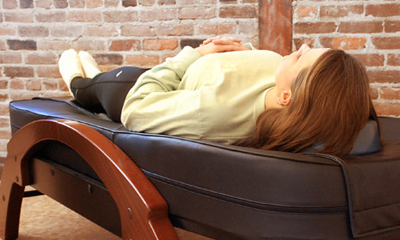 Reduces Stress and Fatigue: Far Infrared heat reduces stress by loosening the muscles and relaxing the body. The gentle warmth you receive will sooth jagged nerves and knotted muscles. You'll feel rejuvenated and renewed, restored in both body and mind. Improves Blood Circulation: Far-infrared heat is absorbed by cells, causing a physical phenomenon called "resonance". Thus the cellular activities are instantly invigorated, resulting in better blood circulation and an overall improved metabolism. Removes Harmful Toxins: When toxins are present in our bodies, blood circulation is blocked and cellular energy is impaired. The body's immune system is inhibited, which makes it difficult for the body to fight disease. When far-infrared heat is applied, the large water molecules in our bodies that contain toxic gases vibrate and are broken down. The encapsulated toxic materials and gases are then released. Just $20 for 30 minutes! Call (502) 409-9300 or click the link below to schedule your Jade Massage!